Better Billy Bunker is a bunker construction method which prevents sand contamination and provides exceptionally good drainage. The 'BBB' Method has been implemented on over 600 golf courses worldwide, including many in the UK and Europe. 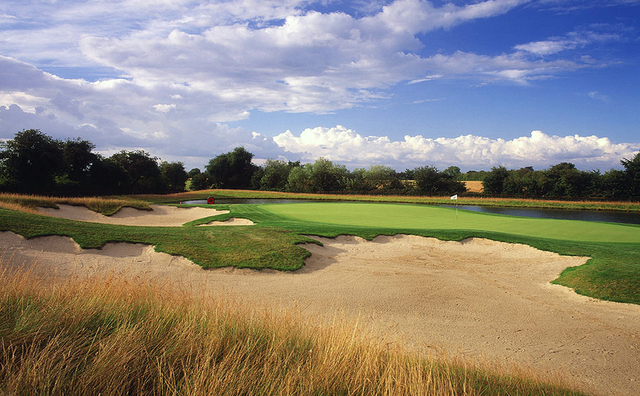 Better Billy Bunker's client list ranges from municipal golf courses to facilities that have hosted numerous PGA and European Tour events, major championships and Ryder Cup matches. BBB allows architects more freedom in their designs and assists greenkeepers and course managers by easing bunker maintenance. John Deere produces Europe’s biggest single brand range of golf & turf equipment. This covers pedestrian and ride-on cylinder and rotary mowers, lawn and garden tractors, domestic and commercial lawnmowers and scarifiers, compact tractors and loaders, turf aerators, sprayers & spreaders, bunker rakes, materials collection systems and Gator utility vehicles. The company has a well-established relationship with tournament golf as official supplier of golf course equipment to the PGA Tour in the USA and the Ladies European Tour, and host of the world famous John Deere Classic at TPC Deere Run, an annual PGA Tour event. We are also proud to supply equipment to prestigious tournaments such as The Ryder Cup at The Belfry and several Open Championships, including Muirfield, Royal Birkdale, Royal Lytham & St Annes, Royal St George’s and Royal Troon, as well as The Walker Cup at Royal Aberdeen and The Solheim Cup at Killeen Castle in 2011. All John Deere machines are sold and supported by a nationwide network of specialist servicing dealers, backed by flexible finance programmes from John Deere Financial. The company’s worldwide parts network provides instant information on parts availability, day or night, with orders shipped from anywhere in the world within 24 hours, and overnight or even same day delivery on the UK mainland. In the UK, Ransomes Jacobsen products are used for turf maintenance on almost every recognised Open Championship golf course, many top level football and ruby stadia, cricket grounds and local authority open spaces. Southwest Greens Construction is the official golf course construction arm for Southwest Greens International, responsible for all major golf course construction projects for the Southwest Greens brand. Counting with the most experienced installation team in the industry, Southwest Greens Construction delivers best in class synthetic solutions for golf courses, Academies, and driving ranges. Southwest Greens International is a division of Shaw Industries. With a network of 75+ franchise operations worldwide, the Southwest Greens organization is regarded as the undisputed Global Leader in the sales, design, construction and maintenance of synthetic golf solutions. The Southwest Greens product is the preferred putting surface for more than 40 professional golfers on the PGA and LPGA Tours including the likes of Jack Nicklaus, Annika Sorenstam, Jim Furyk, Dustin Johnson, Sergio Garcia, and Justin Rose.